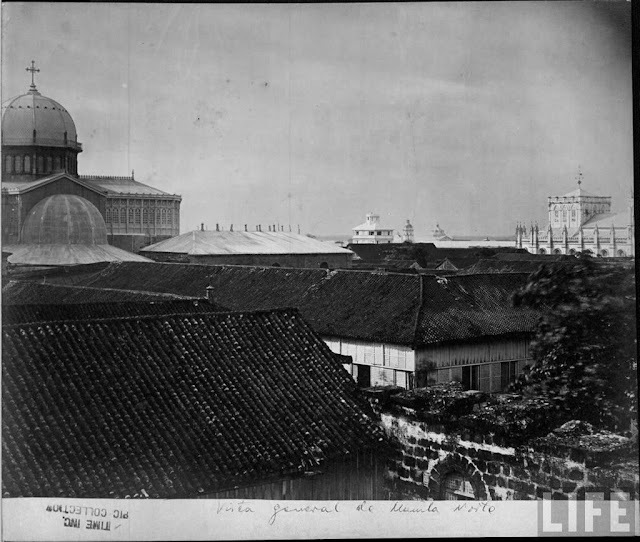 The skyline of pre-war Intramuros was dominated by the domes and towers of different churches. Here you can see the dome of the Manila Cathedral on the left and the Neo-Gothic Santo Domingo Church on the right. You can also see the dome and the tower of the nearby Binondo Church as seen at a distance. Pre-war Intramuros boasted some of the best and most magnificent churches that exhibited three centuries worth of history and religious heritage in the Philippines. Treasures that remain a mere memory of the past, ravaged by the inexcusable destruction of the city in 1945. Out of all the eight churches, only one survived the destruction of the city. One was rebuilt. One was left in ruins. And all the rest were replaced by modern, soulless, box buildings or mediocre, cheap-looking, feeling old ones that are so out of place. Even though most of these churches are gone now, their legacy will always and forever be a part of our identity as Filipinos. Intramuros panorama, c1916. The towers of San Agustin, San Ignacio and Santo Domingo. Manila Cathedral's dome can also be partially seen. Accomplishing this feature has surely taught me a lot of things. I felt a rush of pride and amazement as I was rummaging for photographs and information about these churches. I was always in awe and slightly heartbroken every time I looked at the data that I had collected. I was always so excited to publish it for the whole world to see. The map I made below shows the proximity of the churches to one another. Oh, Visita Iglesia must have been so fun and convenient back then! 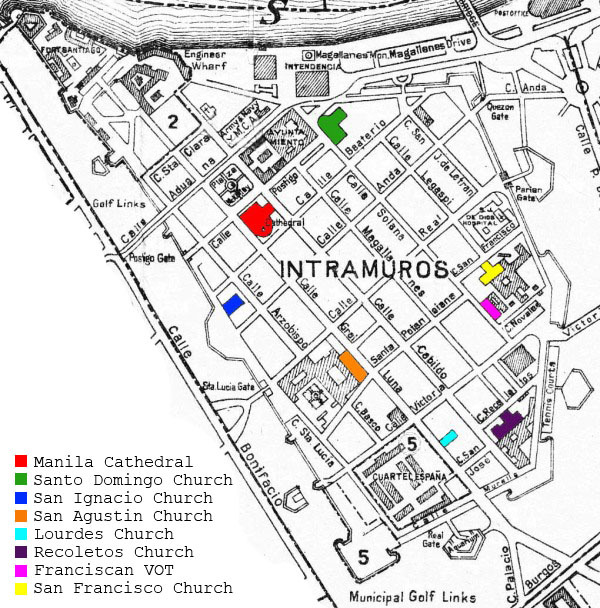 1934 map showing all the 8 churches that once stood proudly in the walls of Intramuros. Only the Manila Cathedral and the San Agustin Church exist today. In case you missed it, just click on the links below and... READ AWAY!